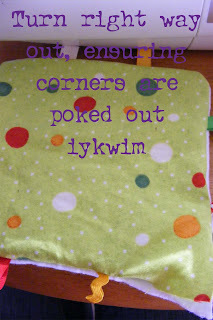 So, the first project up is a taggie blanket for bubba. I've seen tutorials for these in various places - Chica and Jo, and a few others. They are easy to make, and make a great simple gift idea. Mine make a scrunchy noise, much loved by Riley! 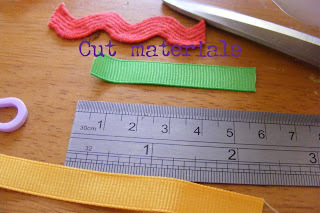 First, cut your materials. I used one layer of flannel, 6.5" square, one layer of cotton print 6.5" square, one layer of "scrunchy" material (in this case, I bought space blankets off ebay. The material is fragile, and tears easily, but holds up to baby slober [and therefore washing] and makes an awesome scrunchy noise. 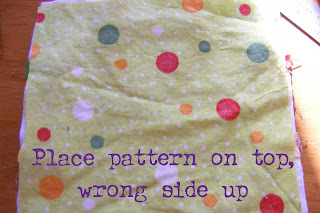 I found this tutorial via One Pretty Thing this morning, where she used cellophane [loving the triangle shape, might try that myself!]) 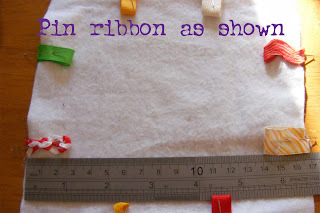 6.5" square and 8 lengths of ribbon of varying textures about 2" long. Pin ribbon to the flannel square, two lengths on each side, at about 2.25" and 4.5" (to allow for .25" seam allowance) Make sure loops of ribbon lay inwards to the centre, so they poke outwards once you turn everything right way out. 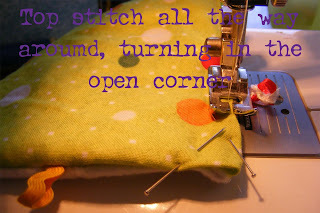 I make sure the pins poke out past the edge of the flannel, to make them easier to take out later. 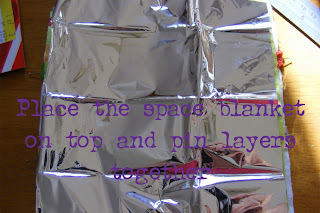 Place the space blanket layer last. Because it is fragile, I only used four pins, one on each side. 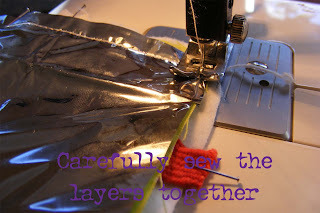 Sew all the layers together. In the past, I haven't been a careful sewer, but I took my time with this, and it showed in the finished piece. Turn your piece right way out (I sewed from ribbon to ribbon the second time, leaving a good gap... the kids could hear me from downstairs swearing when I was trying to turn the first one ~lol~) Being the lazy mum that I am, I didn't iron the material flat, but if you want your final layer to sit neatly, ironing will make it neater and easier to topstitch. 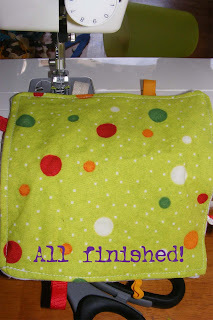 Finished item! This is the second one I made for Riley, and he loves them all! I enjoyed the process so much that I'm going to make a few extras (Steve had some silly idea about making some and selling them, but I don't know if I would go quite that far! 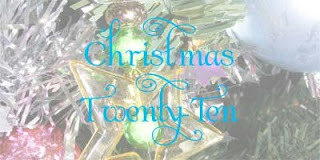 ), but I'll definately be gifting some! Please link me up if you have a go at these, I'd love to see what you make! This is an adorable idea, Cate! I can't wait to go to the next baby shower I'm invited to because this will definitely be part of my gift for baby!